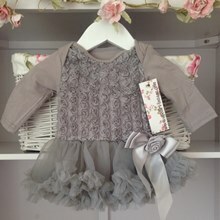 An adorable all-in-one tutu dress for your darling baby girl. Features an attached popper vest detail under the tutu to hide your little one's nappy. Not only does this dress look cute but it is super soft and comfortable for your baby too.